Modern curved design 4 tier metal organiser suitable for desktops ans workstations. Made to endure the toughest working environments - offices, factories, workshops etc. 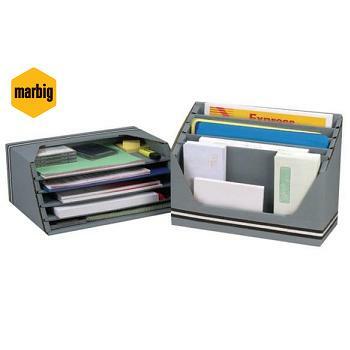 Ideal for storing paper, invoices, letterheads, envelopes, etc, keeping them in easy reach. 4 tiers accommodate both A4 and Foolscap size papers. Modern curved design 6 tier metal organiser suitable for desktops ans workstations. 6 tiers accommodate both A4 and Foolscap size papers. Colour - Grey - Flat packed for easy assembly.